Aneela Maharaj from Eating to Live shared this amazing salad dressing recipe with us. You can whip up this recipe in no time with a blender or use a hand whisk. It is delicious on green salads or drizzled on a grain bowl. It is so delicious, you are going to wish you doubled the recipe. In the video, Aneela mentions "pure" olive oil. What does she mean by that? In North American retail stores, you will find the following types of olive oil: Extra virgin olive oil, olive oil, and extra light tasting olive oil. Olive oil is sometimes called classic olive oil, pure olive oil, or regular olive oil. It is a mix of refined olive oil and extra virgin olive oil. Olive oil has a more neutral flavor than extra virgin olive oil and is generally less expensive. Aneela chose olive oil instead of extra virgin olive oil in her recipe because she did not want the flavor of extra virgin to compete with the other flavors in her salad dressing. You can choose olive oil for any recipe where olive oil will complete with the flavors of the dish, or where you are substituting for flavorless oils like corn, canola or vegetable oils. Put all the ingredients into a blender and blend it until smooth. 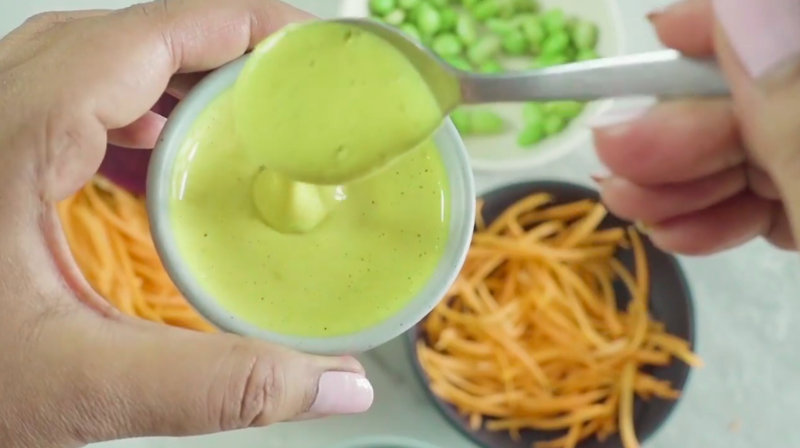 The dressing has a creamy and whipped-like texture and beautiful golden color. Pour it over salad and enjoy!